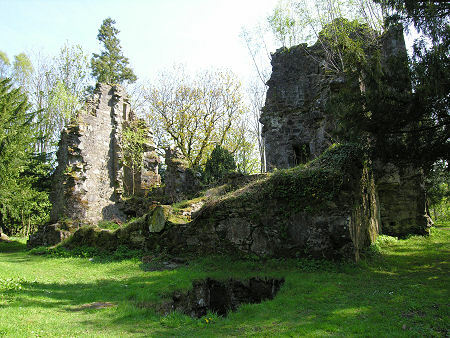 The substantial and gloomy ruins of Finlarig Castle stand on top of a large wooded mound that rises to the north of the minor road that links the north end of the village of Killin to the west end of Loch Tay. Close by are the ruins of the Breadalbane Mausoleum. The site has the River Lochar running to its west and south, and Loch Tay to its east, and it takes only a little imagination to cast back a few centuries and see much of the surrounding low lying land as impassibly boggy. As a result this would have made an excellent defensive site, and although no archeology has ever been unearthed to support the idea, it is thought that Finlarig Castle was only the most recent of a series of defensive structures, possibly dating back into prehistoric times, placed on this site. 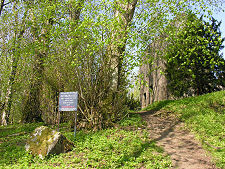 There is a sign next to the path which the feet of the curious have created up the side of the mound from the road to the castle. 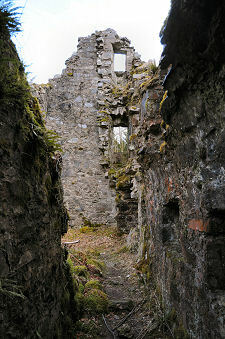 It points out that Finlarig Castle is private property, and that the ruins of the castle and mausoleum are dangerous. Both aspects of the sign should be heeded. As well as a ruined castle and mausoleum this is a burial ground used within the last hundred years and anyone visiting should tread lightly and respectfully. And carefully: the ruins seem to have simply continued to deteriorate since visited by David MacGibbon and Thomas Ross, the authors of a definitive guide to Scottish castles published in 1892, and there is every chance of loose stones falling on the heads of unwary visitors. 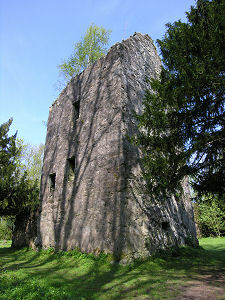 What you find at Finlarig are the remains of a four storey castle built to a Z-plan design: a main block with offset towers at the south west and north east corners. It seems to have been built in the 1620s by Sir Duncan Campbell, 7th Laird of Glenorchy, probably on the site of an earlier castle. 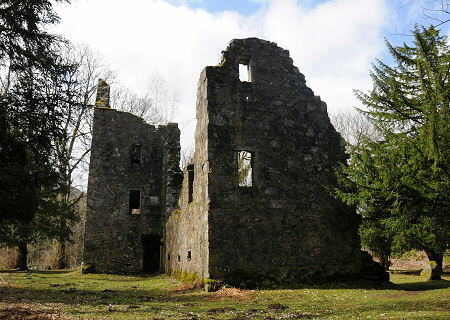 "Black Duncan", as he was known, had a liking for castles and was also responsible for building those at Balcardine in Argyll and Achallader on the edge of Rannoch Moor, as well as Edinample Castle near Lochearnhead. It is said that in 1651 the Scottish Parliament was summoned to assemble at Finlarig Castle, but that only three members actually turned up. It is also said that Rob Roy MacGregor visited the castle in 1713. The south side of the castle is the best preserved. From the north the castle appears more a tumbledown pile of stone. 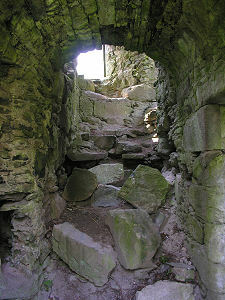 Parts of the cellars can be traced, and the south west tower or wing also still stands to a good height, and the bottom of what - with the eye of faith - looks like it might have been a spiral staircase can still be seen. Nothing at all remains of the north east tower, which would have originally stood at the opposite corner of the castle. The castle's most mysterious feature can be found just outside its north wall. Here there is a stone lined rectangular pit. This, almost certainly, served as a water storage tank to hold water running off the roof of the castle in the absence of a well. Folklore has chosen to interpret it as a beheading pit, where unfortunates were forced to kneel, placing their heads in the hollow at one end (alternatively interpreted as an overflow from the water tank) while the axe was swung. 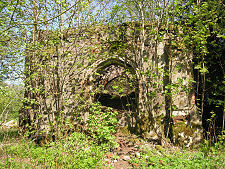 A little to the east of the castle stand the heavily overgrown ruins of Breadalbane Mausoleum. This was built in 1830, possibly on the site of a chapel built in 1523 by Sir Colin Campbell, the 3rd Laird of Glenorchy. 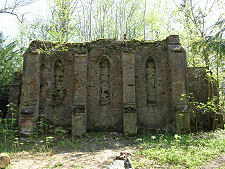 The Chapel of the Blessed Virgin was the traditional burial place of the Campbells of Breadalbane. The mausoleum that replaced it is in almost as poor a state as the much older nearby castle and the state of its stonework looks, if anything, even more precarious. The mausoleum had presumably already fallen into disuse by 1922, when Sir Gavin Campbell, the 17th Laird of Glenorchy and 4th Marquess of Breadalbane was buried nearby, to be followed by his wife, Lady Alma Graham in 1932. 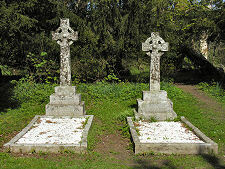 Today the Celtic stone crosses which mark their graves occupy a site which follows centuries of family tradition, but they look a little forlorn and lonely, standing almost in the shadow of the ruins of Finlarig Castle and the Breadalbane Mausoleum.